I’m twenty nine years old. I’m an adult. I pay my bills. I do my taxes. I go to jury duty. I stand in line at the post office without heavy sighs. I floss too! I totally floss. And yet. Somehow. 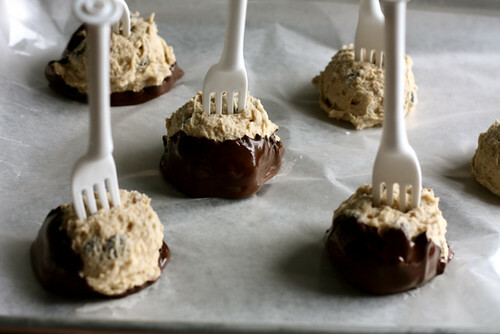 I thought it would be ok… not just ok, but reasonable… not just reasonable… but a good idea to make chocolate chip cookie dough, freeze it and then dip the balls in melted chocolate. Now I have a freezer full of giant cookie dough balls dipped in chocolate and I’m panicking. I need an adult. I’m about to eat cookie dough for lunch, cookie dough for dinner, cookie dough for dessert, and then cookie dough again for second dinner. Incidentally, if the blatant consumption of raw sugar and butter offends your sensibilities, perhaps you might be better suited with these Blueberry Applesauce Muffins or Low Fat Oatmeal Banana Bread. And you’ll have to accept my sincere apologies for the ridiculousness of frozen cookie. and chocolate. together. forever. 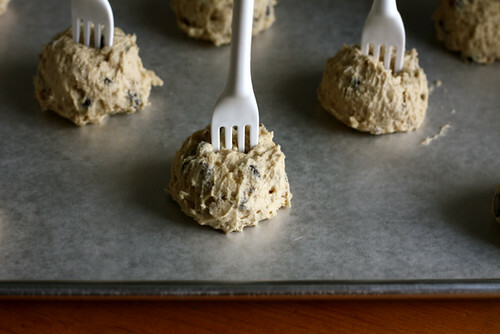 Raw cookie dough. Sooo dang good. Now before anyone starts yelling about raw eggs and poison and disease, let me assure you that this dough has no raw eggs in it. Instead, I used Greek yogurt as the binder. You might also use applesauce or peanut butter if you don’t have thick yogurt on hand. Here’s how this happened. I made eggless cookie dough, scooped it up in generous portions on a waxed paper lined cookie sheet, stuck cute plastic forks in the dough and froze those suckers overnight. The next morning I melted down some chocolate chips, dipped the frozen dough balls and returned them to the freezer. Serve them right from the freezer… It’s sort of the best thing ever. Now if you’ll excuse me… I can hear someone calling my name from the freezer. It must be these dough balls. It would be rude not to respond. In the bowl of a stand mixer fit with a paddle attachment (or with a large bowl and a wooden spoon) cream butter and sugars until light and fluffy, about three minutes in the machine. Beat in yogurt or applesauce or peanut butter along with the vanilla extract and stir to combine. Whisk together the flour, baking soda and salt. Add all at once to the butter and sugar mixture and stir until incorporated. Fold in chocolate chips and wanuts. 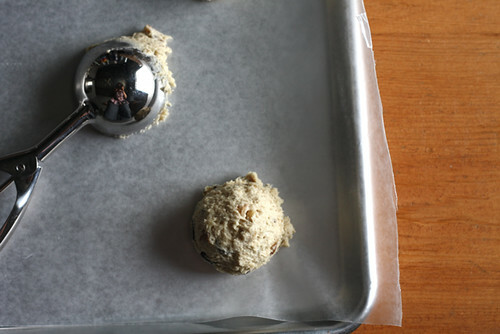 Scoop large spoonfuls or ice cream scoops onto a waxed paper lined cookie sheet. 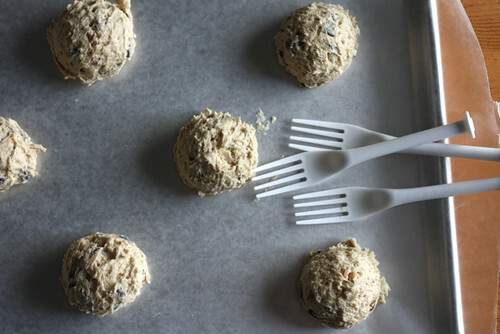 Spear each dough ball with a cute plastic fork or a popsicle stick. Place in the freezer overnight or until frozen, at least three hours. 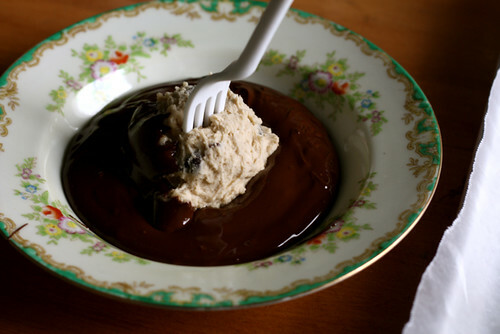 When ready to dip the balls, melt chocolate chips in a small saucepan over a low flame or in the microwave. Remove balls from the freezer and dip into warm chocolate. Return to the lined cookie sheet and return to the freezer to harden. Serve cold from the freezer. Wooow. I totally understand how you can eat them for breakfast, lunch and dinner. It would also be awesome to make tiny tiny balls, stick toothpicks in them and dip them in chocolate, wouldn’t it? Chocolate Chip Cookie Dough Pralines! we don’t normally eat raw cookie doughs here in my side of the globe but they look sooooo good. 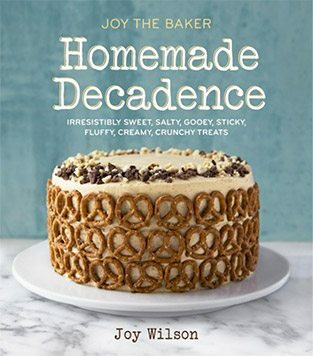 I’ve got to try this, this is so perfect since I don’t really bake…bookmarked it,Joy. 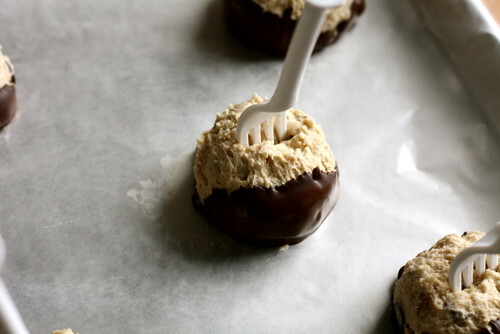 when the dough is perfectly round like that and the balls have been dipped in chocolate with a wee fork attached, it’s basically a real dessert! 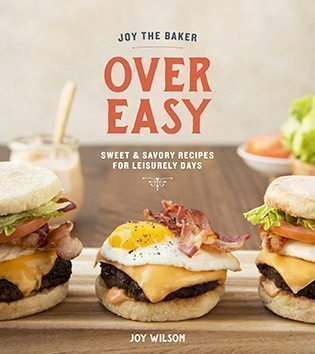 God bless you, Ms. Joy the Baker; you’ve legitimized cookie dough consumption. My roommates and I did these a couple of weeks ago… But we didn’t freeze the chocolate! We just dipped our frozen cookie dough balls into hot bubbling chocolate and ate them, fondue-style. Almost too good to be true. Ain’t that just the sweetest temptation? Teenagers like me are supposed to be body conscious and all, but, wotthehell. I’m savoring every bit of fast metabolism. Im’ma go now and start melting some good ol’ chocolate. Hey, if they called my name, I’d go running. Sounds absolutely wonderful. I could a couple right now! Brilliant idea, I’ll definetely try them, here it’s so hot that I can’t even think of using the oven. Thanks! That is seriously evil. I think I’m getting a call from the freezer too! Ohhhhh they look so delish. and I love the idea of frozen cookie dough. One day while I was eating Ben & Jerry’s Cookie Dough Ice Cream I dreamed about just eating a bowl of yummy dough. I told myself this would be too crazy. But now I know. It is not. 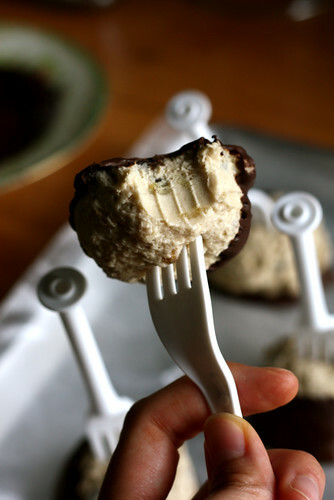 and I’ll make these right now. Joy, it’s swim suit season. How could you do this to me? They look so glorious that I may have to go make them now, and when I do I’ll know who to blame!